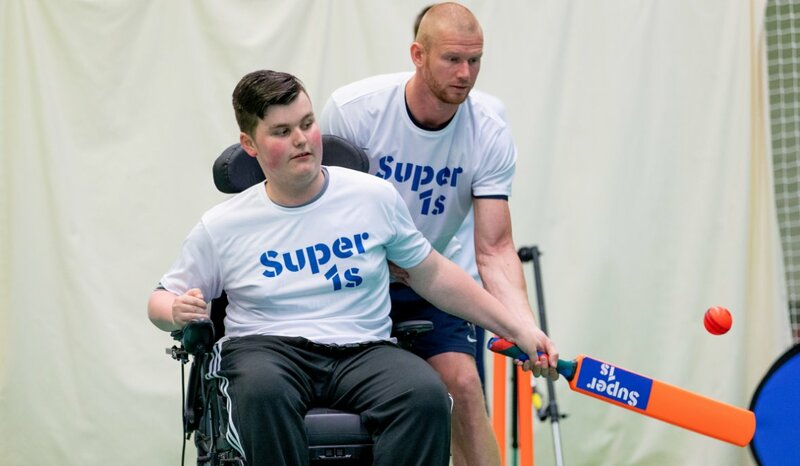 A new disability cricket programme called Super 1s was launched in Peterlee on Thursday 17 January by regional governing body Durham Cricket Board in partnership with national cricket charity the Lord’s Taverners. Super 1s – the charity’s national programme, which gives young people with disabilities the chance to play regular cricket – will be delivered in Durham for at least the next three years. The project will create community cricket hubs in three focus areas in the county, with the first one launched in Peterlee this week. The hubs will offer free coaching sessions to young people with disabilities aged 12-25 on a weekly basis. Super 1s will support Durham’s school disability kwik cricket programme by creating a community offer to serve as a base layer to a disability cricket pathway. The Lord’s Taverners introduced Super 1s to London in 2013 and have since expanded the programme to a further 14 counties, with Durham being approved for the project in September 2018. The initiative will help create a Physical Disability and Learning Disability (PDLD) team for the first time in Durham, which can participate in the national PDLD pathways. Director of Cricket Development at Durham Cricket Board Graeme Weeks said: “We’re really excited to work with the Lord’s Taverners and deliver Super 1s in Durham. This project gives us a fantastic opportunity to make a real, lasting difference to disability cricket in our county. “Super 1s will enable us to create accessible community offers for young people with disabilities and the appointment of a full-time development officer will allow us to dedicate the time and energy that is required to make a genuine difference. “For a number of years now we have been working towards setting up a PDLD team in Durham and I strongly believe that the Super 1s programme will give us the reach needed to make this happen. The Super 1s hub in Peterlee runs at Peterlee Sports Centre (SR8 1AF) every Thursday from 4.00pm until 5.00pm. Coaching sessions are free of charge and don’t require booking. The sessions are suitable for young people with learning and/or physical disabilities. For more information about the project, get in touch with Super 1s Development Officer, Oliver King at oliver.king@durhamccc.co.uk.